Successfully Added 16GB MP4/MP3 Player with 3 Inch LCD - Video File King Edition to your Shopping Cart. 16GB MP4/MP3 Player with 3 Inch LCD - Video File King Edition. This portable media player (PMP) includes an easy to use interface for easily accessing your collection of music, videos, pictures, e-books, and plays all of today's popular video and music file formats (including youtube FLV files). If you want an MP4 player perfect for all your digital videos (MPEG4, RM, RMVB, FLV, WMV, AVI), then the crisp 3.0 inch TFT screen on this unit is a beautiful thing for your eyes to behold. Reading e-text and viewing pictures is also a pleasure with the bright and clear LCD screen, and can be easily shared with friends sitting next to you. Playing your digital music collection (MP3, WMA, FLAC, APE, OGG, AAC, WAV) is simple and fun with the easy load and go file manager of the unit. This is a portable media player (PMP) with an incredible amount of potential for fun and for practical applications, and is available for a much lower price than you would ever get for a branded PMP with only some of the same functions. Everything that anyone could possibly want in portable digital products is once again available at a low wholesale cost and with no minimum order quantity (M.O.Q.) from the leader in direct from China electronics, Chinavasion. Secure some new sales for yourself by stocking up on this new large screen PMP to sell at your online / physical store or feature it in your latest eBay, Amazon or uBid listings and use our reliable dropshipping service to maximize your limited resource of time. Bonus: Premium quality gold plated earphones now included! 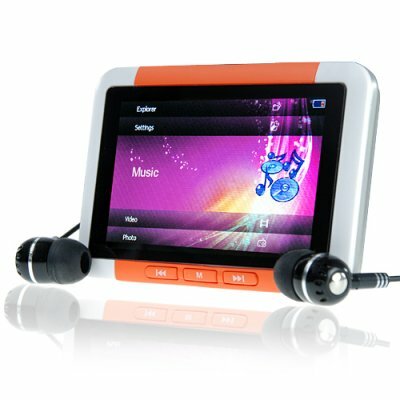 16GB MP4/MP3 Player with 3 inch LCD. Compatible with a wide range of file formats; more than in any "famous brand" players. Don't let its size fool you, beautiful 3" screen is great for viewing e-books and videos. Simply hook up the CVSC-221 to your computer via the high speed USB 2.0 connection and load it up just like any other folder or flash drive.